Once you have signed up to create a Hotmail account, you will probably check your emails on a regular basis: if you are checking your email account from a web browser (like Internet Explorer), the easiest solution is to set Hotmail as your homepage. This way, you will end up in your Hotmail inbox whenever you open a new browser window. In this tutorial, we will show you how to set Hotmail as homepage for Internet Explorer on Windows 7, Windows Vista, and Windows XP (which depends mostly on the version of Internet Explorer you are using). Follow these simple steps to use Hotmail as homepage: note that, to make things easier for you, with explain how to make your Hotmail inbox the homepage, as opposed to the Hotmail Sign in page (if you are using your own computer, going directly to your emails will be faster; if you are using Windows Live Hotmail from a public computer, the safest option is to make the Hotmail login screen your homepage, instead of using the automatic login option). First, open a new Internet Explorer window: then, type "www.hotmail.com" or "www.live.com" inside the address bar, as shown on the screenshot below, and hit Enter: this will load the Hotmail sign in screen - if you are on a safe computer (where you don't mind being automatically logged in to your account, sign in now). If you want your homepage to be the email inbox, navigate to it. Then, you can either make Hotmail your only homepage (choose "Use this webpage as your only home page"), or add Hotmail to your existing homepages (in which case, pick "Add this webpage to your home page tabs" instead). Then, click on the "Yes" button to accept the new setting and apply Hotmail as homepage. From now on, when you option Internet Explorer 7 or Internet Explorer 8, it will automatically load your Hotmail account (either the sign in screen, or your email inbox, depending on what you chose to do in the first step). If you are using Internet Explorer 6 (in Windows XP, or earlier versions of Windows), click on the "Tools" menu, and choose "Options". Then, after making sure that the Hotmail URL (web address) is loaded inside the "Home Page" text box, click on "Use Current" to set Hotmail as your homepage. Click "OK" to accept the new homepage. 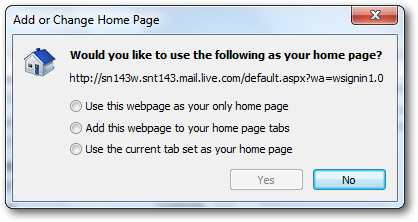 This is all it takes to add or set Hotmail as your homepage in these versions of Internet Explorer. You can test the new option by opening a new browser window, and Hotmail will load as unique homepage, or as one of your existing home tabs!